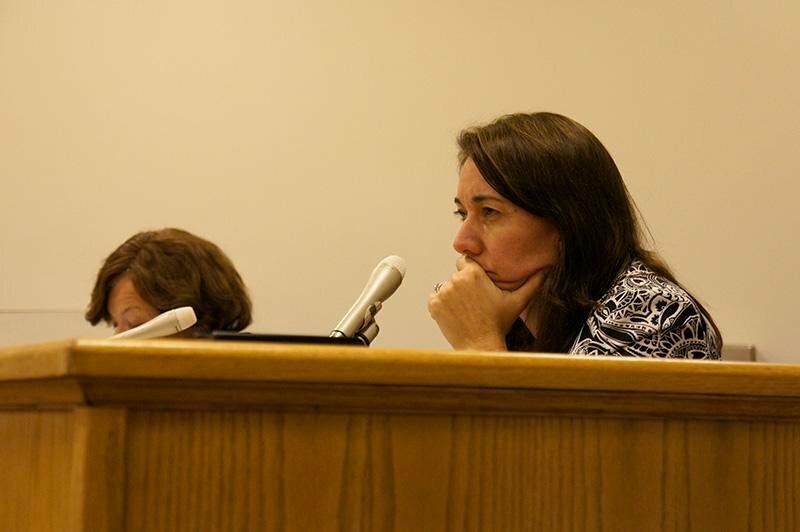 Evanston Councilwoman Coleen Burrus listens to the discussion during the Monday City Council meeting. The meeting addressed new city ordinances and honored the football team for its Gator Bowl victory. City Council celebrated NU’s Gator Bowl victory but voted down a Howard Street construction project Monday night. Mayor Elizabeth Tisdahl presented a city award to Northwestern’s football team, recognizing their victory during a committee meeting earlier in the night. MVP player Jared Carpenter received the award on behalf of the team. Jim Phillips, vice president for athletics and recreation, said the team was “humbled and honored” to receive the award in an interview with The Daily after the committee meeting. However, the night at the Lorraine H. Morton Civic Center turned much more serious during citizen comment. John Bamberg Sr. and Carolyn Murray, parents of two teens killed in recent shootings, alleged that police were unresponsive to their post-shooting inquiries. Carolyn’s son, Justin, was shot Nov. 29 and Bamberg’s son, Javar, was killed Dec. 12. Murray also alleged Ald. Ann Rainey (8th) had called 19-year-old Leslie Calvin Jr., a teen shot in her ward on July 4, 2010, a “bad seed.” Rainey responded later that she did not use such language. Rainey also said Calvin had a history of arrests and she had spotted the kid shooting into the street randomly. “I said at that time that this was a child that was either going to end up dead or end up killing somebody and spending the rest of his life in jail,” she said. Alderman also voted 6-3 against a proposal to build a Howard Street theater, a project which received vehement objection from residents during an earlier administrative and public works committee meeting. The city bought two vacant storefronts at 727 and 729 Howard St. in February 2011 to convert them to a theater, and began negotiating with Edgewater-based City Lit Theater in June 2012 to sell the renovated property to the company. A preliminary city study from 2011 had estimated the renovation cost at $600,000, only one-third of the current cost. Because of the increased costs, the city would try to negotiate a lease agreement with the theater instead of selling it, said Steve Griffin, the city’s director of community and economic development. Evanston resident Junad Rizki objected to the project during citizen comment of Monday’s city council meeting, arguing the project financing was unsound. During the council meeting, Ald. Coleen Burrus (9th) opposed the project citing the hike in costs. “I just can’t support this much money on one particular project,” Burrus said. Ald. Jane Grover (7th), Judy Fiske (1st) and Mark Tendam (6th) agreed, arguing the council needed additional information on the City Lit negotiations before approving the construction project. Rainey, whose ward includes Howard Street, said she was “surprised” by the council’s reaction. Rainey advocated for the project during both meetings, arguing it fits into other business developments in the district, including the pending launch of a new restaurant.